Electro Adapter Manufacturers Military and Mil Spec Connector Backshells in a banding backshell, spring termination backshell and molding adapters. Cable termination backshells can include cable strain relief clamps or gland seals if required. 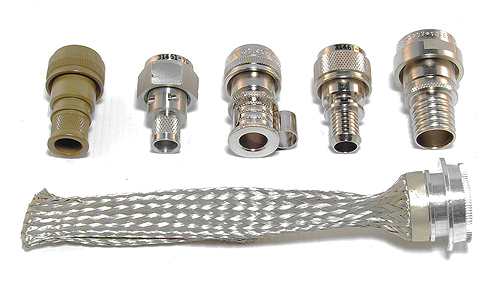 Backshell Adapters are available in many shapes and sizes to aid in cable termination. Cable shield sock terminations along with shield splice bushings make cable terminations quick and reliable. Shrink Boot backshells are selected for environmental benefits. If we do not list the M85049 number you seek. Let us know if you can use a Commercial version.